Back when the 1992 X-Men series first aired, there were a number of characters that one could consider 'break out stars', and the southern-belle power house known as Rogue was certainly on that list. Her banter with Gambit, good ol' southern charm and tragic backstory that was explored quite a bit made her a well-rounded character... you felt bad for her that she couldn't touch anyone because of the nature of her powers and you rooted for her and Gambit to somehow get together. Over the world of comics, Rogue's popularity from the animiated series lead to her getting the two four-issue mini series, one in 1995, another in 2001... and then a full 12 issue run in 2005 which one could consider to be just two six-issue mini-series... and it's that 12 issue run that is collected in 'Rogue: The Complete Collection. Moving on to the artwork, the twelve issue run had three different art teams and boy does that show, and overall 'Going Rogue' looks a lot better and more consistent than 'Forget Me Not' since only one art team worked on first six series, while two different teams worked on the second. Taking that out of the equation, then overall the artwork is solid, easy on the eyes and helps convey the story to the reader, and you can't ask more than that. 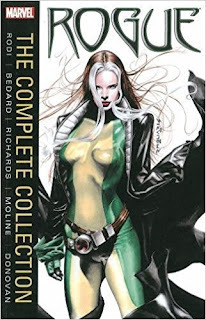 If there is a problem with Rogue The Complete Collection is that it is only collecting the 2005 12 issues and not included the first two mini-series, because then that would be truth in the title, still for what it is, it is a sold trade collection that gives you two six-issues stories and more of an insight into the mutant from Mississippi. You can get it at Amazon... in fact use my affiliate link purchase it, you pay nothing Amazon has it listed at, and they kick me a few bucks.